Although HART Theatre's current offering of "Arsenic and Old Lace" is something of a mixed bag, the large opening night audience at Joseph Kesselring's classic comedy laughed heartily throughout the show, and I am confident that audiences will share this enthusiasm throughout the play's run. Director Sarah Ominski Kearney has drawn some superb actors who deliver tightly crafted performances, and the play's great bones shine through despite a few rough spots. The play was written in 1939 and premiered in early 1941, so while Germany and Japan were kicking up trouble around the world, the United States had not yet entered into World War II. All action takes place in a living room in Brooklyn, where sweet old spinsters Abby and Martha Brewster live in the old family home with their nephew, Teddy. Mental illness does not run in the Brewster family, it gallops — Abby and Martha's secret hobby involves murdering lonely old men with their potent and poisoned elderberry wine, while Teddy (who believes that he is Teddy Roosevelt) helps by burying the bodies in the Panama Canal, which he is digging in the cellar. Another nephew, homicidal maniac Jonathan, appears on the scene with Dr. Einstein, an alcoholic plastic surgeon whose recent attempt to alter Jonathan's appearance has left him resembling Boris Karloff. And then there's the hero, drama critic Mortimer, who has been spared the worst of the family's murderous quirks (although there may be those who would argue that drama critics are monsters, too). Mortimer is in love with Elaine Harper, the minister's daughter who lives next door, but he worries about marrying her given his family's unfortunate genetic heritage. Much of the play revolves around Mortimer's attempts to shield his lunatic kin (except Jonathan — nobody likes him!) from an unforgiving world. Diana Lo Verso and Robin Reece Michaels are everything you could ask for as the maiden aunts. Their timing, inflection and wide-eyed innocence are utterly convincing and completely unselfconscious; nothing is overplayed or annoyingly stereotypical, and it's worth the price of admission just to watch these two veterans ply their trade. Tony Broom completely commits to Teddy's delusions, and watching him charge up the stairs (naturally, yelling "charge") and blow his bugle is guaranteed to perk up even the droopiest in the audience. Sarah Thornton's Elaine is a fine mix of propriety and "minister's daughter" freethinking; she manages to blend skepticism of her unusual neighbors and fondness for their quirks. Tanner Morton draws a lot of laughs with his portrayal of Mortimer Brewster, and he captures the character's protectiveness and affection for his family, indecision about Elaine, and frustration and disbelief as he learns about his aunts' unfortunate hobby. Given the stress in Mortimer's life, it's not unusual that he flies off the handle — but I think his performance would be enhanced if he reeled in the volume and frenzy of his outbursts. Another strong comic performance that would benefit from a touch of restraint is Erin Bickler's Officer O'Hara — she's definitely funny, but her Irish cop affect is a bit too broad and distracting, especially when she intermixes touches of Scots with her Irish accent. Master carpenter William Crawford has delivered another of his striking sets — he is miraculously skilled at making the most of the limited space on the HART stage, and somehow manages to smoothly fit in the requisite number of doors as well as the all-important windows and staircase. However, I would have liked to see a bit more set dressing — Crawford provided a fine palette that would provide a great backdrop for more of the tchotchkes and knickknacks that Abby, Martha, and their predecessors would have acquired and displayed over a lifetime in the family home. Kelcey Weaver's costumes are generally inventive — a nice mix of '30s and '40s styling with the turn-of-the-century dresses for Abby and Martha, who clearly live with Teddy in the past. The gold-buttoned bibs that convert regular men's suits into cop attire are especially creative, although the difference between the black bibs and the dark navy suits is a bit jarring. Three other tiny quibbles: I would have preferred if Michaels had followed Lo Verso's lead and stuck with her natural hair, as the wig is just a little too obviously fake. Tyler Hulegaard's single, oddly placed scar does little to convince us that he is a dead ringer for Boris Karloff (or any other movie monster). The program shows only one intermission, but there are actually two — and the second one is entirely unnecessary, only prolonging an already long show. The hair and makeup issues could both be resolved fairly easily — as, perhaps, could the spare intermission. One final note, on behalf of playwrights everywhere — a little proofreading might have caught the error in spelling Kesselring's name on the cover! 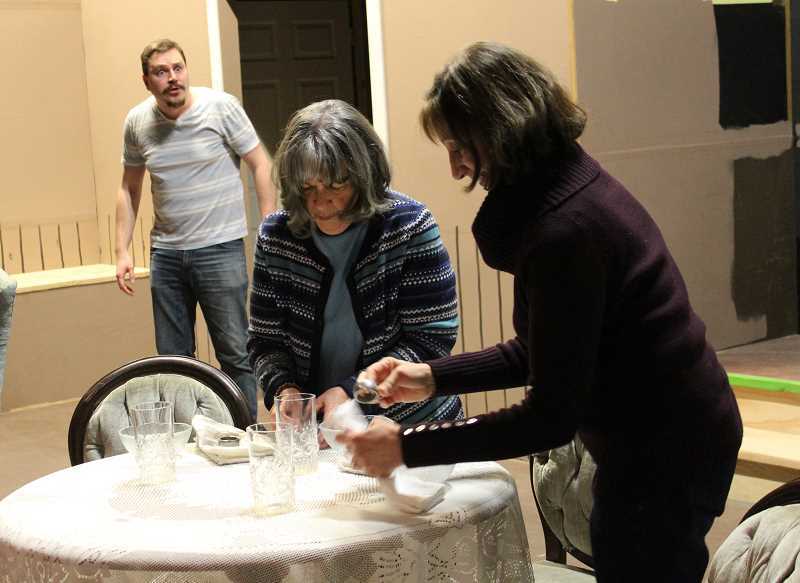 While I found a number of small problems, HART's current production definitely captures the humor and charm that has made "Arsenic and Old Lace" a staple of community and high school theater for decades.